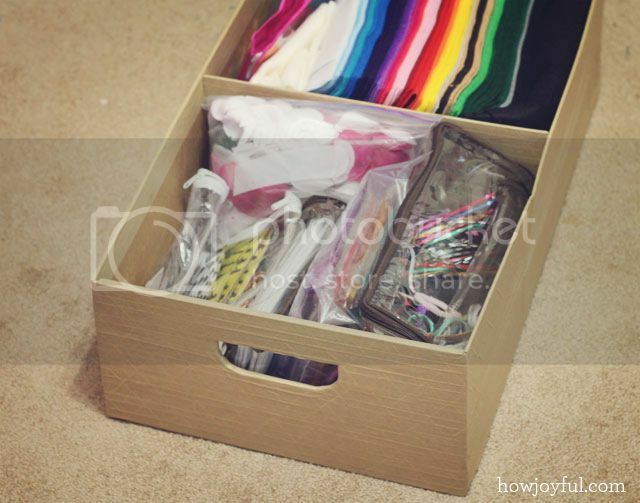 By now most of you already know that I love to use cardboard for pretty much everything I can think of =] so using it to organize my sewing room is not a surprise, but I still wanted to share because I know this can help someone else with problems similar to mine. 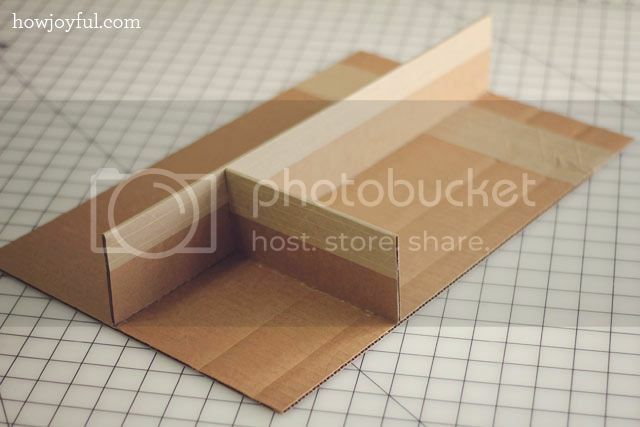 This will not be a step-by-step tutorial just because my build-in is custom, so I am not sure if my measurements will work for anyone else, but I am sharing the idea and how I made mine, so you can also organize with cardboard. 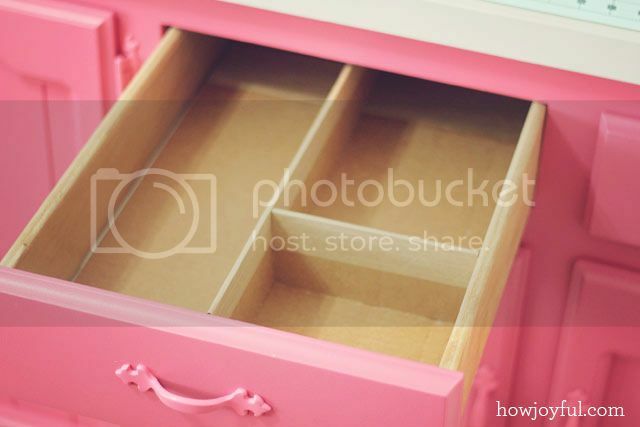 I customize the spaces to fit my craft and sewing supplies in each of my 4 drawers with cardboard inserts and the cost for all of that plus the cardboard drawers for the awkward space below the drawer was $0 I used the leftover boxes from our move, a hot glue gun, gummed craft paper tape, ruler and a Xacto knife. For the organizers I first measure the width and height, cut a piece of cardboard 1/8 of an inch shorter so that I could have some moving room, I made a little circle cut on the back so that I could lift my piece from there once it's in the drawer. Then I placed everything I wanted to organize on the drawer, made little groups and drew on the cardboard the separations that I was going to need. I measure how deep the drawers were and cut pieces that fit my sketch of separations. I used the kraft tape to finish the top so that it would look better. If you want to go the extra mile I would recommend you to either cover the cardboard with paper (easy and economic alternative), fabric or you can even paint them =] I decided to leave them just like that for now. I will probably make them pretty later, for now, I just focused on the functionality. 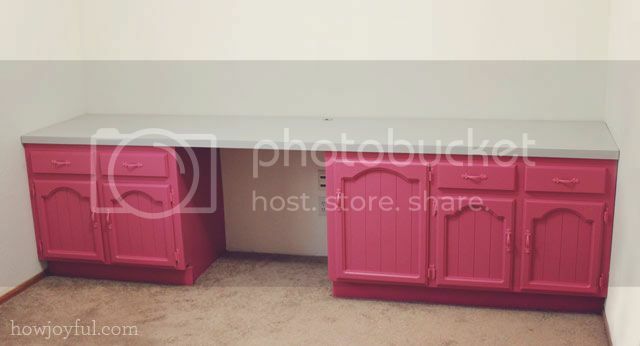 The good part of the built-in is that is fairly deep, but that means that the space below the drawer is awkwardly long. So anything that places there on the back could eventually be forgotten. I love having that space but I needed a way to be able to reach all the way down there. So I decided to make custom drawers for all of them. I basically measured just like with the drawer-insert and also measured the dividers I needed for the inside depending on what I was going to place on the drawers. Here you can see the one I did for hair accessories and felt. I also made some for elastics, zippers, and ribbons. Basically, anything that was small and didn't have a specific spot yet on my sewing/crafting room. I cover the drawers with the kraft tape all over and made them double cardboard so that they would be reinforced in case I decided to put heavier stuff there. they slide fine and if I need to take something from the far back I can just pull the whole thing off. so much easier than trying to find a container or plastic tubs that fit that really awkward space. 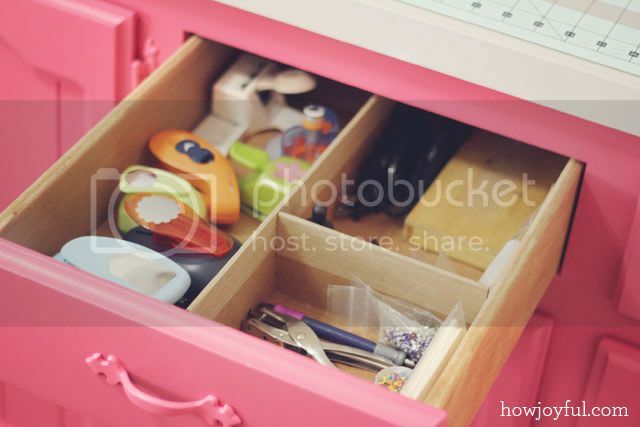 And here one of my favorite drawers, probably because of all the pink inside =] This is my sewing accessories drawer, so I keep all needles and sewing machine parts along with all of my purse hardware and little things. I love how organized everything is on the built-in and what a cheap way to do it, you can say it's eco-friendly too! because I recycled all of our moving boxes with all of the cardboard drawer-inserts I made, not just for the craft room but for our room and the nursery too =] but you'll get to see the rest later, once they are all pretty! 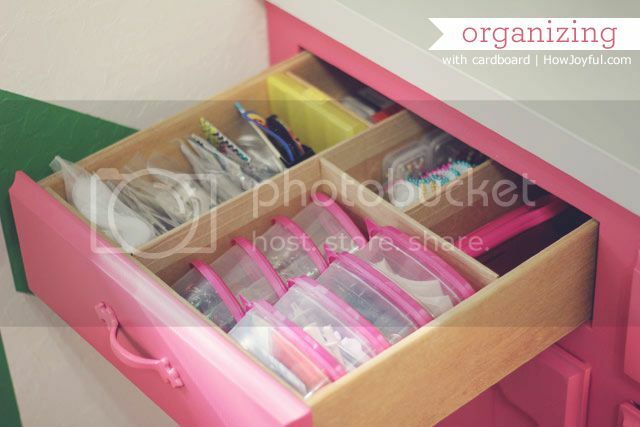 I hope you guys enjoyed and got inspired to organize with cardboard too =] it's so easy and budget friendly! What a clever idea to utilise your space. 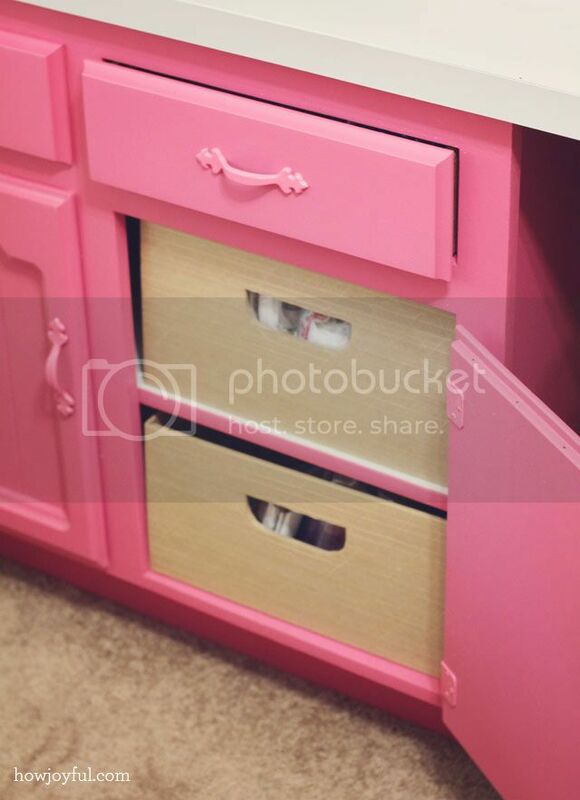 I love the pink cupboards! I love this! 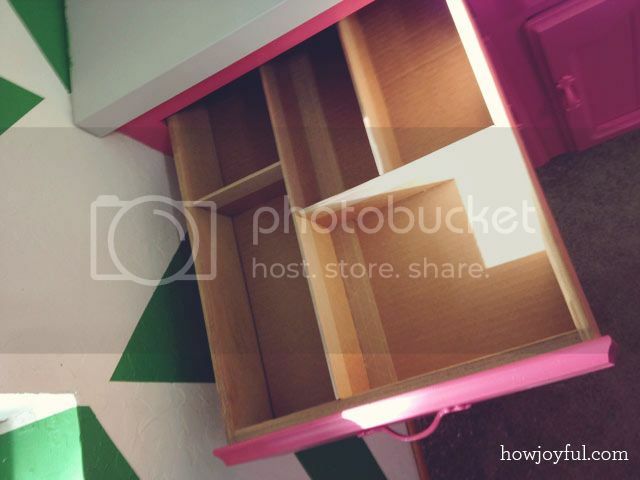 I love reusing and repurposing things we have around the house. Cardboard is so plentiful! I have done this for my sock drawer and covered them with duct tape. love your drawers! I did that long time a go for my pencils dividers, it works like charm =] So sad that duct tape is expensive compared to the kraft tape =[ or I would do that to all of them. this is such a great idea! I am wondering what you think about covering the dividers in fabric or something- do you think that would work or would it be too hard? Another great idea, they look so professional, as good if not better than the ones you can buy. Keep the ideas coming please!!! Good ideas!!!! I love it. It looks so professional! I thought it was wood. You did a superb job. Pues creo que te ha quedado de lujo!!!!!! Es cierto que la separación de los compartimentos se pueden hacer con simples contenedores de plástico, pero creo que utilizando el cartón no pierdes espacio ninguno y además lo haces exactamente a la medida que tú quieres, además, podrás remodelarlo a tu gusto en cuanto lo necesites. 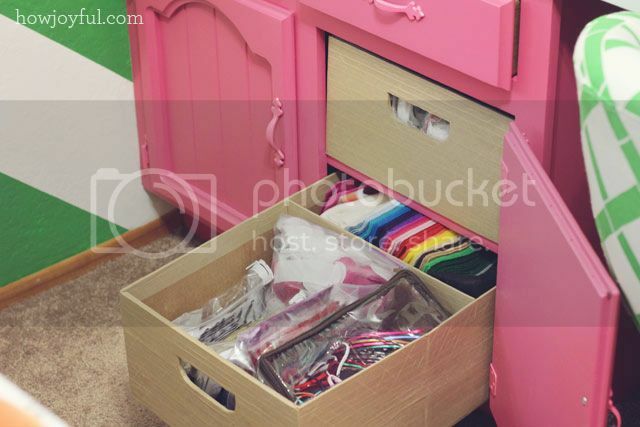 Creo que voy a hacer algo así para los interiores de los cajones de mis hijas, aunque he solucionado algunos separadores, utilizando unos cestos de tela del Ikea, creo que hacerlo en cartón y forrarlo de tela, por ejemplo, también me será una buena solución. Te envío un cordial saludo y un feliz parto. Estás guapísima, que lo sepas…..disfruta de esta etapa, que es maravillosa, aunque nada comparable con tener a tu bebe en brazos. Muchas gracias Andaira!! Yo tambien tenia cajitas en los cajones al principio pero encontrar cajas que ocupen todo el espacio seria mas dificil que hacer esto =] y ademas no gaste ni un peso!! Un saludo grande!! What a wonderful idea! Thanks a lot! I love your idea and will probably try it in my own home.A bit of advice though, if you’re going to blog you should proofread your writing. You’ve got multiple verb tenses, run on sentences, and several words spelled wrong. You’ve used the wrong verb tense with this auxiliary verb. Try using a different verb tense. Hey, Diane / grammar police. Back up and chill. I think we all know the blogs we read and enjoy aren’t necessarily flawless, but geesh! If you feel the need to get all judgy about your run-ons, go tutor some kids in English, they may be more appreciative of your SAT analysis than the rest of us. I am a new and I absolutely LOVE your blog especially about organizing using cardboard, who would have thought to use cardboard. I have been looking for a simple, cost effective solution and I found you just in time! Fantastic. Need to do this in my studio. Thanks for sharing this tutorial! This is just SO clever! Fantastic! I have been looking for dividers for my drawers but never find any that fit my needs. Now, thanks to you, I can make them myself! Just found your blog, WOW!! 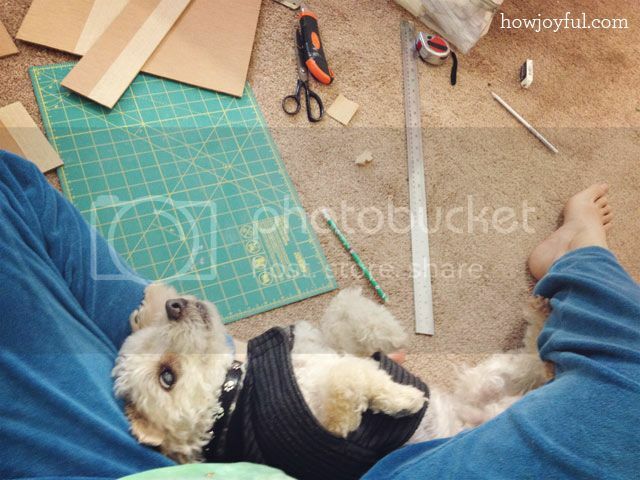 What a creative soul you are, thanks for sharing! Genius. I had never thought of cardboard to organize. I now have a plan for my makeup drawer. yay! Amazing and time saving. Thank u so much. 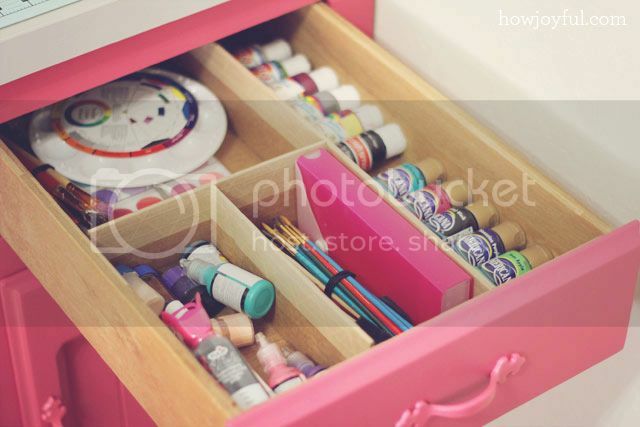 I love this idea – i have boxes in drawers at the moment, but want long runs of dividers for embroidery threads, yours is much more stable as you glue sides to a base – brilliant. 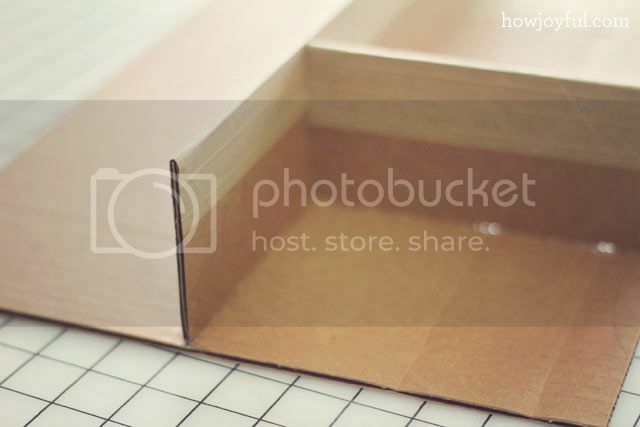 Did you use just the hot glue to attach the dividers to the bottom cardboard sheet?